Mussolini rose to power after the March on Rome in 1922. Just six years later he had established himself as absolute dictator and took the title of “Duce.” He conquered Ethiopia in 1935 and annexed Albania in 1939 – the same year he joined a Tripartite Pact with Nazi Germany and Imperial Japan. He lost power and popularity after suffering major defeats in North Africa, Greece, the Balkans, and Russia. Allied forces landed in Sicily on July 9, 1943, and an invasion of Italy’s mainland was inevitable. Germany would not promise sufficient forces to defend against such an onslaught, and the Fascist Grand Council also turned against Mussolini, arresting him on July 25, 1943. Fascist organizations were dissolved, and Marshal Pietro Badoglio was appointed Prime Minister of Italy. Italy wished to remain neutral, but Churchill insisted on the country’s co-operation as the cost for the “passage back.” Just a few weeks later, on October 11, Badoglio’s brand new government declared war on Germany. Meanwhile, the Germans were setting Mussolini up as the head of a puppet regime in northern Italy – the Italian Social Republic – after their occupation of the area in September 1943. But by April of 1945, Mussolini knew he was in deep trouble. The Allies were advancing north through Italy and knowing that the Communist partisans in Italy would also try him as a war criminal, he decided his best bet was to flee to a neutral country. The partisans shot Petacci, and she fell to the ground. Mussolini then opened his shirt and asked to be shot in the chest. 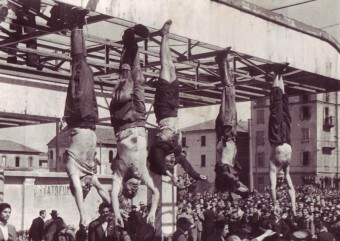 The partisans obliged, but it took a couple of tries before Il Duce was finally dead. Soon all of the entourage had been killed, thrown into the back of a van, and taken to the Piazzale Loreto in Milan, the location of a mass execution of partisans the year before. The corpses were beaten, kicked, and urinated on before they were left to hang upside-down from a beam outside a gas station for public revilement. People surged around to mock and spit on the bodies, and also to assure themselves that Il Dulce was really and truly dead. When Adolf Hitler heard of Mussolini’s undignified end, he was determined he would not suffer the same fate. 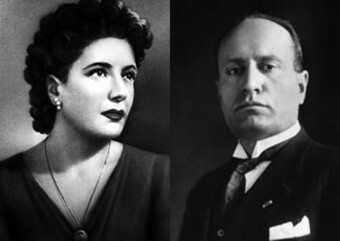 Two days after Mussolini’s death, he shot his new wife and long-time mistress Eva Braun, and then poisoned and shot himself. He ordered that both their bodies be burned after their deaths to prevent any post-mortem desecration.